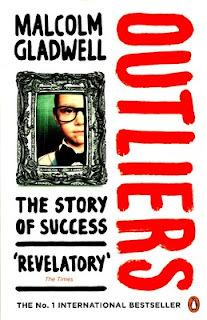 OUTLIERS - the story of success by Malcolm Gladwell (2008), Penguin Books, p 309. The question as to what is that which makes people successful keeps coming to our mind as we keep reading about great people and come across their journey. I have been trying to find out that formula which can help me understand the basics for becoming a successful person. Shakespearean belief that Some are born Great, Some achieve Greatness and on some Greatness is thrust upon caught my attention while I started relating Greatness with Success and later realized that there is a difference in being Successful and in being Great. While reading about different research works and books I came across this book titled OUTLIERS by one of my favorite authors Malcolm Gladwell (MG) and having gone through 'Blink' and 'The Tipping Point', I thought that my familiarity with the writing style of MG might solve the puzzle that I have been facing all this while. MG successfully traces the background of successful individuals and develops a story around it focusing on finding out the antecedents. Biological and biographical characteristics of individuals determine a kind of behavior individuals follow. Key success factors of individuals are determined by the culture, background, growing up, geography (location), prevailing political-social-economical-technological conditions, etc. This book starts a story interwoven with various researches by educationists, psychologists and sociologists to defend so succinctly the argument and convinces the reader chapter after chapter what the author wants to convey, the constituents of being successful. The reasoning given in the book is at times never ever thought of but he is able to win through his in depth study and linking the condition with the outcome. The cause of maintaining better cardiological standards is explained through the research done by Bruhn and Wolf which is able to keep the reader engrossed and curious to further learn about other stories. Community living through providing a strong support system with ‘a thinking beyond the individual’ was found to be the main reason unlike their biological and geographical background. MG writes - I want to do for our understanding of success what Stewart Wolf did for our understanding of health. The book is divided in two parts - Opportunity and Legacy. The author seems to be convinced that there are these two great differentiators which make people successful or otherwise. Coincidental yet providing a defense for being successful hockey player as they were born in a given month makes it really interesting and the as the argument seems making sense, one realizes that it is just because in order to have admission into Hockey Academy one has to be of certain age and many a times it is manipulated. The point is the available opportunity to these players who join the academy and who are not able to join, makes all the difference, though at the end of the day it is genuine performance which matters. The opportunity which was capitalized by Bill Gates or the people of his tribe makes the case of being successful through the presence of opportunity more than the talent. It really does make sense and we have seen it all around us. Many talented individuals could not achieve greater heights in their career just because they did not get the opportunity or they just could not have that talent which could convert the opportunity into targeted performance. In case of technological transformation (especially in connection with computers), people who were born in 50s could avail the opportunity in 70s. It was just in time for them. Growing up with a statement – practice makes the man perfect, I realize that outliers also possess patience and get an opportunity for seriously practicing for their passion, their focus, their target and resultantly achieve it. 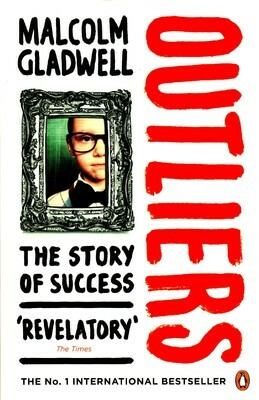 As portrayed by MG in this book through the example of The 10,000-Hour Rule, and illustrated through the success of Beatles, Bill Gates, Bill Joy and others in the same club. A lot depends on the growing up of individuals and what they learn from their growing up. The prevalent conditions and situation and the art of successfully dealing with it in one’s advantage is what becomes a contributing factor for having an attitude to learn and work hard (or otherwise). The culture of honor determines one’s cognitive faculties through an attitude, perception, and personality. Depending on whether one has grown as farmer or herdsman, in the bordering town or mainstream city, one carries oneself and forms a certain kind of behaviour. This is Legacy and MG believes that it plays an important role in distinguishing successful individuals from not-so-successful ones. Extrinsic factors apart from biological characteristics of an individual determine the scale of success (or otherwise) for them. The case of crash of Korean Air plane is explained, reasoned and corroborated in such an excellent way which displays MG’s brilliance in putting the threads together and weaving an excellent story with it, leaving behind so much of bulleted learning. For the students of behaviour and management it makes an important read. The conditions in which one grows up drives him/her to develop a certain kind of behaviour which results in an attitude to perform one’s best and to be assertive about one’s position which is part of a legacy an individual carries forward with. Number of days and hours of effective schooling in a year and day in eastern world as compared to western world is relatively more. The school year in the US is, on average, 180 days long, in South Korea it is 220 days, and in Japan it is 243 days long. This develops an attitude of hardworking in a child from the very beginning which is driven by the fact that one needs to put more efforts. The example of rising before dawn 360 days a year makes sense for the case of having more effective working time. Knowledge Is Power Program in New York City is the result of this learning in order to get prepared to compete with their eastern counterparts. The dedication of the book to Daisy, the grandmother of MG is very apt and the reason has been explained by him towards the end of the book. This in fact makes Daisy as well as MG and MG’s mother an Outlier. I strongly recommend this book for anyone who believes in the pursuit towards excellence and in the quest of knowing the rationale.